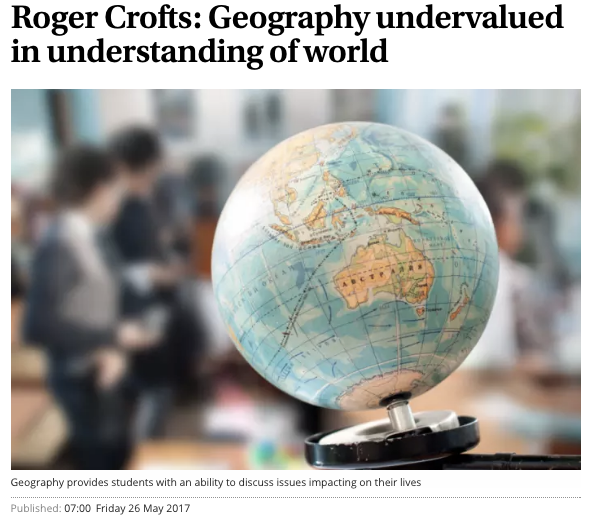 I've met Roger Crofts fairly regularly over the last six years or so when attending the SAGT conference, or visiting the Royal Scottish Geographical Society. He's a great supporter of school geography. He's written a great piece in 'The Scotsman'. There are some very useful quotes for those needing to remind people of the value of our subject. Geography is a key ­subject for all future citizens, as it opens the whole world to pupils, improves their ­global view and provides a ­context for learning numeracy and literacy. Let’s make the most of it, as geography is the ­subject of our time.